People love to talk about where they work. Over 200, 000 years we’ve gone from running across the African savannah to staring at a computer monitor in a white, airless box. This lesson is about….the office! For those with absolutely no time the entire lesson can be downloaded here. If you use it, drop me a line and say thanks. If it bombs then…..well, sorry. Tell me how to improve it. I agree with Lindsay in that learners often find ways ‘around’ tasks and take the line of least resistance. However, I think that with careful planning, these problems can be ‘designed out’. So, I wanted learners to design the ‘perfect’ office space as a task. But I knew that they would probably get started and scribble something down on paper quickly just to finish the task, which wouldn’t involve much higher order thinking or language use. So I started with the idea of a ‘code’. All maps have codes. 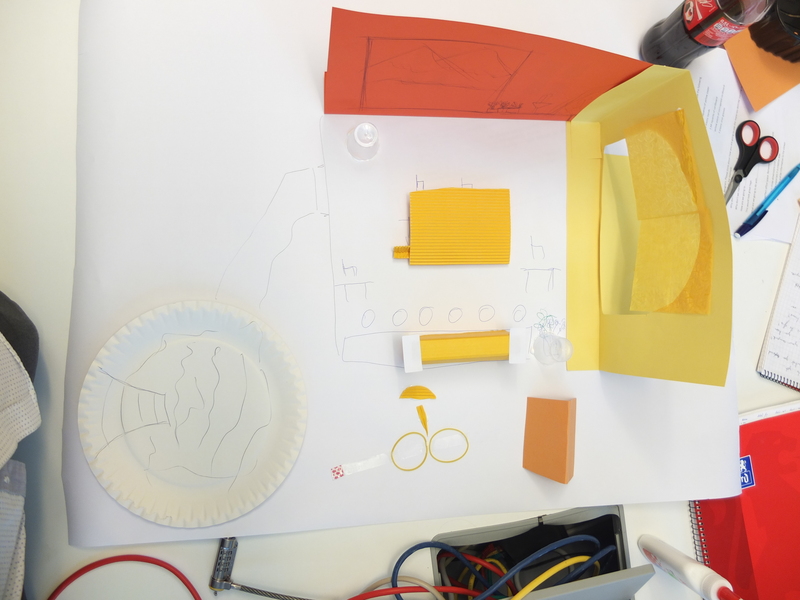 If we can get learners to create a ‘code’ before they start the task of designing something – then this will force them to think more about the range of objects they can include and how to represent them visually. And it worked! By dividing the task into parts that can’t be ‘short-circuited’, including a stage where learners can criticise each others’ designs, I think that the end result was better. That is, their designs worked better conceptually and visually and linguistically, they had more opportunities to use English. The lesson starts off with a clip from ‘Office Space’, one of my favourite comedies. The film features ‘Rachel from Friends’ as a badge-wearing waitress (“37 pieces of flair”), a running stapler gag and the total destruction of an office photocopier. What’s not to like? Learners describe what happens in the video and what kind of objects they can see (e.g. cubicles, files, computer monitors, etc). We then move on to discuss some statistics on ‘sick building syndrome’ and the learners get to talk about their office spaces – what they like or don’t like. 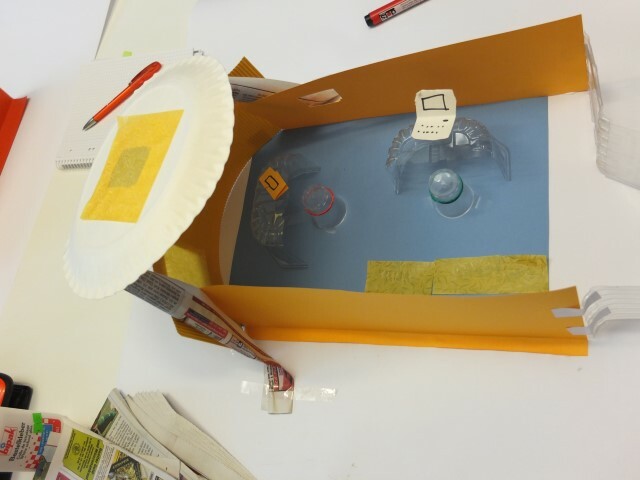 Post-task you could ask the learners to research ‘sick buildings’ or office spaces that have been transformed into healthy buildings, or any other aspect of the topic that they find interesting. The whole lesson plan is here. What’s the linguistic aim of all this then? Ok, I hear you. There’s no explicit grammar or vocabulary focus to this lesson, though the teacher can introduce both as he or she sees fit. It’s also a great way of building trust and teamwork in a group that doesn’t know each other very well. For this reason the lesson was included in the first lesson of syllabus 3. So, if any of you Business English teachers use this lesson, or any other on here, please drop me a line and tell me how it went! 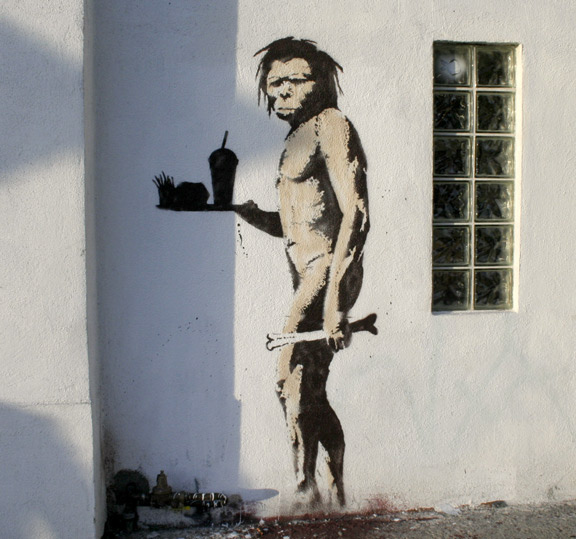 Banksy caveman courtesy of Bill on Flickr, some rights reserved. This entry was posted on June 25, 2014 by paulwalsh in Uncategorized and tagged codes, comedy, Decentralised Learning, Decentralised Teaching, Decentralized Teaching, design, Learner-Centred Curriculum, negotiated syllabus, office space, office spaces, sick buildings, syllabus 3, task, tbl.